You will feel safe and more than comfortable when you place your expensive bikes, your amazing mower or even the kids summer toys inside the 8′ x 6′ Traditional Pent Security Shed. 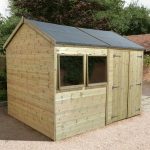 This manages to offer you an ideal amount of space if you do not have a huge garden and if you do have a large garden then this would make for one excellent extra storage shed. It has a very interesting look with its small and high placed windows making it very hard for people to peer inside and see what you have. A good sized door is used to allow easy access, but because of its strong design it is going to make people think twice about trying to get inside. To ensure this is a very secure structure, high end materials have been used in its construction. The shed is made from redwood including the walls which are made with very strong, 12 mm tongue and groove shiplap cladding. The floor and roof is also made with tongue and groove boards making this one very impressive shed from the bottom all the way to the very top. Keeping it all together is a robust and very cleverly designed frame which will keep the shed strong for many, many years. 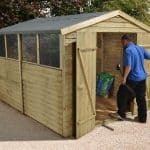 The idea of the 8′ x 6′ Traditional Pent Security Shed is that it is not only going to provide you with a place to keep things tidy, out of the rain and well organised. But it is also going to keep them securely tucked away and out of the reach of potential thieves. We love the very, no nonsense look that this shed has on the outside which is sure to make thieves think twice about trying to get inside. In the shed there is more than enough room for the average garden as the width is 8 feet and the depth is 6 feet. There is also plenty of headroom inside here where even at the lowest point of the shed there is 5 feet 9 inches with the highest point being an impressive 6 feet 7 inches. For the roof, Treetops Traditional have gone for a pent style of roof. This was a very smart choice as a pent roof has a more hard and robust and dare we say less friendly look than an apex roof. This is not to say the roof is some kind of eyesore, the roof still has a good look thanks to the high quality roofing felt that is covering the very impressively strong 12 mm tongue and groove boards. The pent design will protect what you are storing inside as no rain will sit on top. In all we do really like the appearance and the durability of this roof. As this shed has been designed to keep things safe, Treetops Traditional have used redwood which is very strong. This is what the 12 mm tongue and groove shiplap cladding is made from, as is the rest of the shed actually. It prevents water from getting into the shed and of course it gives it, its high quality and impressive look. One thing that we love about this line of shed is the frame. This is why these are such sturdy sheds and this one here really does have a strong backbone in the form of a 44 mm x 27 mm, rounded edged frame. This is incredible and it really will make this a structure that is strong and firm. 12 mm tongue and groove boarding is what is going to be under your feet. This is thicker and higher quality boarding than most sheds out there and we are actually very surprised that this has not seen the price shoot up. No matter how heavy the things you are wanting to store in here, this floor is going to be able to take it. While the shed is being prepared all of the wood will undergo a free basecoat treatment. 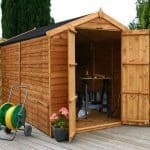 This will ensure the wood is well protected when the shed is delivered and while you are constructing it. As this is the UK, there is of course a high chance you will be building this in the rain, but at least you know the wood will be protected while you do. The basecoat treatment is a good bonus, but you will still want to give it a coating with wood treatment as soon as you can. Also treatment on a yearly basis is required to make sure the wood stays rot free for the life of the shed. The shed comes with a one year guarantee, but because of the way the shed is designed and materials used. The guarantee is something you will hopefully never have to make use of. 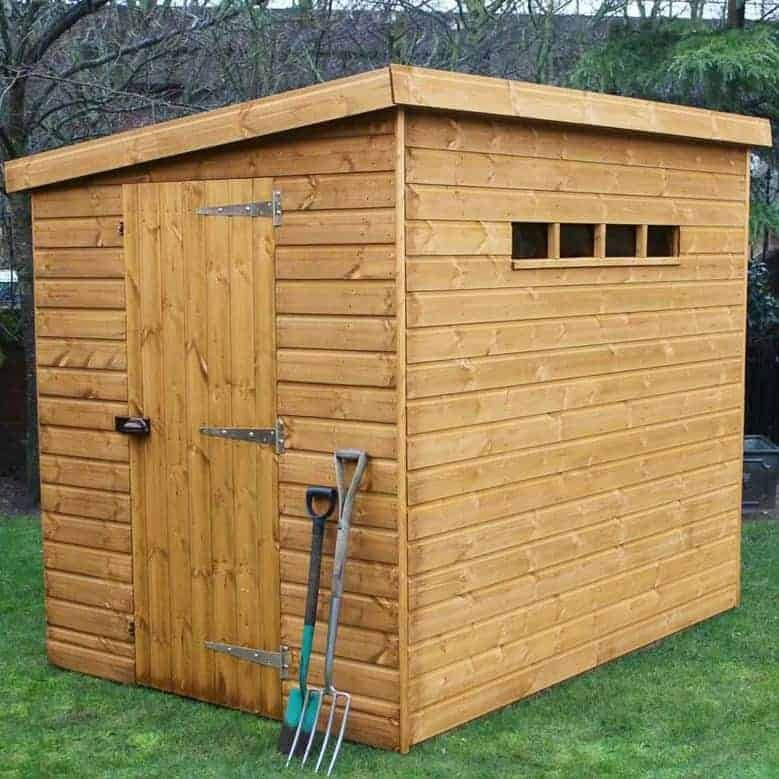 Any shed that is claiming to offer a lot of security must have a strong door and this we can tell you is a very strong door. The door is made with the same high quality of wood as the rest of the shed and it is secured to the wall with three heavy duty hinges. One interesting thing is that there is a protector for a padlock on here which is really cool. When the door is open there is more than enough room to get into the shed. 2 feet 6 inches is the width of the door which is right in line with other sheds and the height is 5 feet 9 inches, again this is in line with other sheds and what we would expect. The windows that Treetops Traditional use on the 8′ x 6′ Traditional Pent Security Shed are just amazing and one of the things we really do love on this line of sheds. These are small windows that are placed rather high. This allows them to let in natural light, but it also makes it really difficult for people to look inside. The glass used for these windows is very high quality stuff as it is horticultural glass. This is a shed that really does offer a lot of security. It is very robust and designed to keep things safe. The only thing we wished they would have included is a padlock. They have that great padlock protector yet they do not give you a padlock which just seems very strange to us. This is one very private shed. Those windows really do make it hard to someone to look inside and we do not think you will find it necessary to add blinds or curtains. There is not really anything major you can do to the shed in terms of customising it. We think something like a hanging basket or giving it a coating of wood treatment that is coloured would allow you to give the shed your own little touch. Treetops Traditional do offer a couple of extras for you to consider. If DIY is not your thing then there is an installation service at a cost of £94.99. If you are wanting to make that impressive flooring even more strong and sturdy then there is a set of floor bearers you can add for a cost of £34.99. As the idea of this shed is security, we knew this was going to be rather high quality. But it turned out to be even more high quality than we thought and we are sure you are going to be very impressed with this. While it may need a coating once a year of wood treatment. This will protect the wood well enough so that you can easily get around 20 years’ service out of this shed. It is certainly not the largest shed out there, but for those extra special or expensive items it is ideal. While they do offer an installation service. If you do not want to pay for the service and are building this with a friend, you should have no problems. The instructions are easy enough to follow and the whole process should take no more than 5 hours. While this is not huge, the shed does what it does very well and we feel for the security it provides that it is well worth the money. Final Thoughts: The 8' x 6' Traditional Pent Security Shed from Treetops Traditional is not the largest in their security based line of sheds, but this is still something that impressed us. 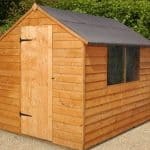 The build quality is impressive and we have no concerns at all about the longevity of this shed. 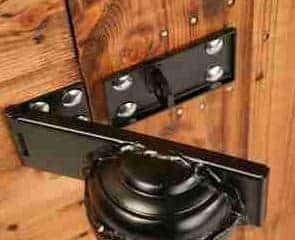 Adding a padlock will make this well and truly locked up tight and all your belongings safe and secure in the process. 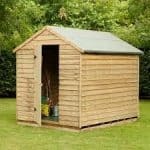 While most of the attention is on the quality and storage space, we must say that this is still a pleasant shed to look at and it has a design that really is something you do not see a lot. 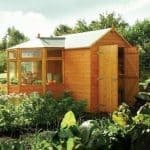 If security is your main concern when buying a new shed then we feel this is something you should strongly consider, especially if you do not have a huge garden.